One of the many beautiful things in the San Francisco Bay that we love to share with our charter guests is the Bay Bridge. It’s a special treat to be able to view it in a relaxed manner from the water, rather than driving across it, either hurriedly or in the middle of traffic. Originally opened on November 12, 1936, The San Francisco – Oakland Bay Bridge was well supported by politicians and citizens alike. The opening ceremony was described as “a dozen old-fashioned New Year’s eves thrown into one,” with President Hoover in attendance, an automobile parade, and a fireworks display. 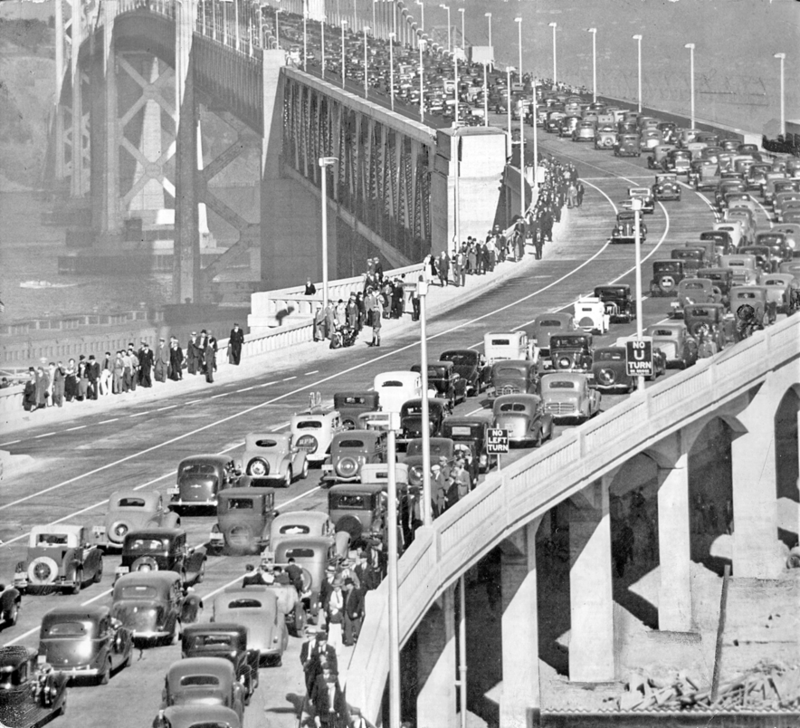 The opening day of the Bay Bridge. 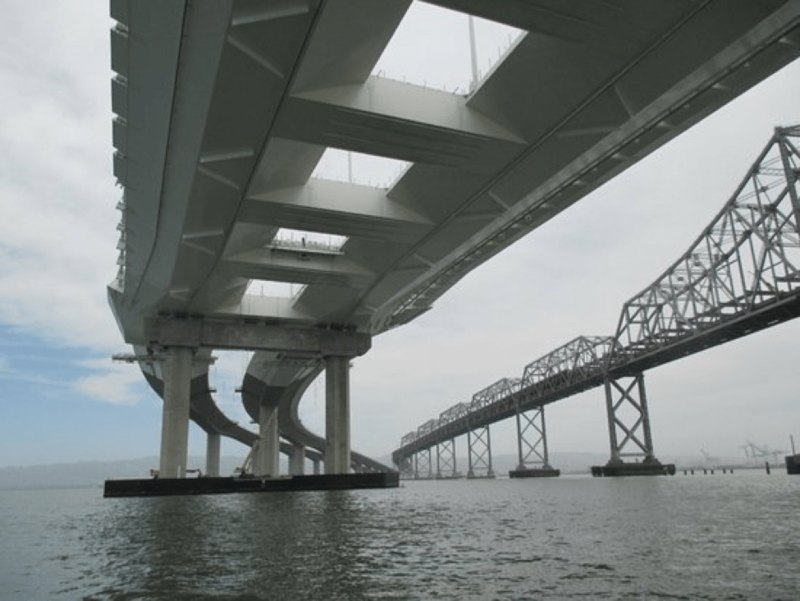 For us, the Bay Bridge marks the beginning of so many of our yacht charters. As the crew of Just Dreaming, we get to enjoy the excitement of our guests as we make our way under the bridge, whether it’s for someone’s birthday, a wedding, or a corporate outing. On our tours to Treasure Island or Jack London Square, we get an amazing view of the eastern section of the Bay Bridge. Originally a cantilever suspension bridge, after the 1989 Loma Prieta Earthquake, a redesign of the eastern section began. The bridge is now a causeway connected to a self-anchored suspension bridge, with beautiful white suspenders running down the middle and views of the water on either side. The new Eastern Section of the Bay Bridge on the left, the former on the right. While it was under construction, we had many of our guests request a peek from underneath the bridge. From 2002 until 2017, we were able to watch the construction of the new span alongside the old. The destruction of the old bridge began in 2013, gradually disappearing from the skyline. We were thrilled to be able to provide such a unique vantage point of the shifting waterscape on our way out to Clipper Cove at Treasure Island, or heading back from the Central Bay toward Jack London Square. And now, the elegance of the newly designed span continues to wow us all. 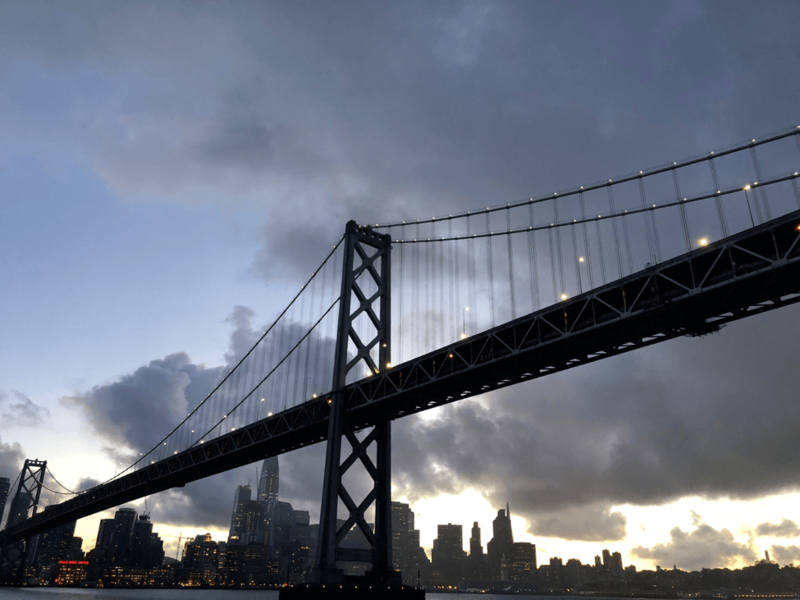 When we journey to the Golden Gate Bridge, Angel Island, or out toward San Pablo Bay we start our journey traveling under the western span of the Bay Bridge. The Ferry Building and Coit Tower greet us once we have traveled out from underneath the double suspension bridge, with its double deck that once housed both cars and trains. Heading back after a full day, our guests and crew are welcomed back home with the view of the Bay Bridge lit up with flashing white lights against the darkening sky. 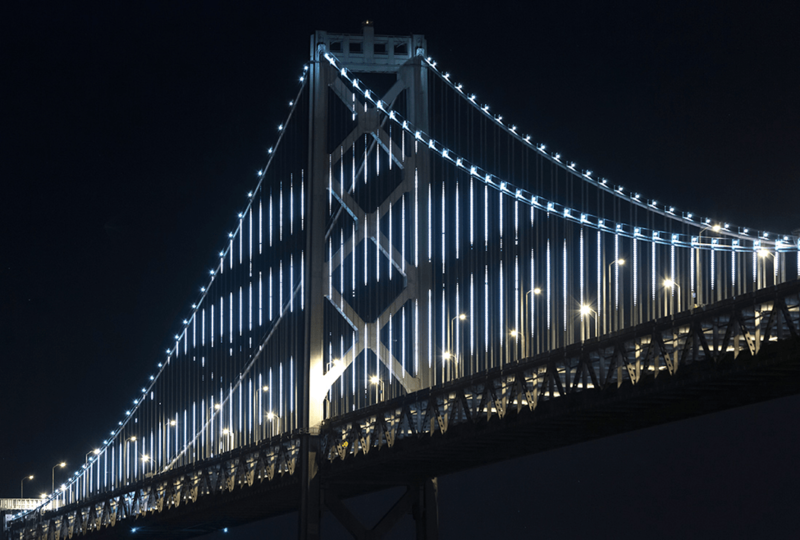 Developed to commemorate the 75th anniversary of the completion of the Bay Bridge, this light display is best known as The Bay Lights. It was designed by Leo Villareal with numerous unique patterns playing in brilliant LED along the vertical suspenders of the bridge, viewable only from the outside. Although the installation was intended to last for one year, a local fundraising group known as Illuminate was successful enough in their efforts that the lights have become a permanent feature. 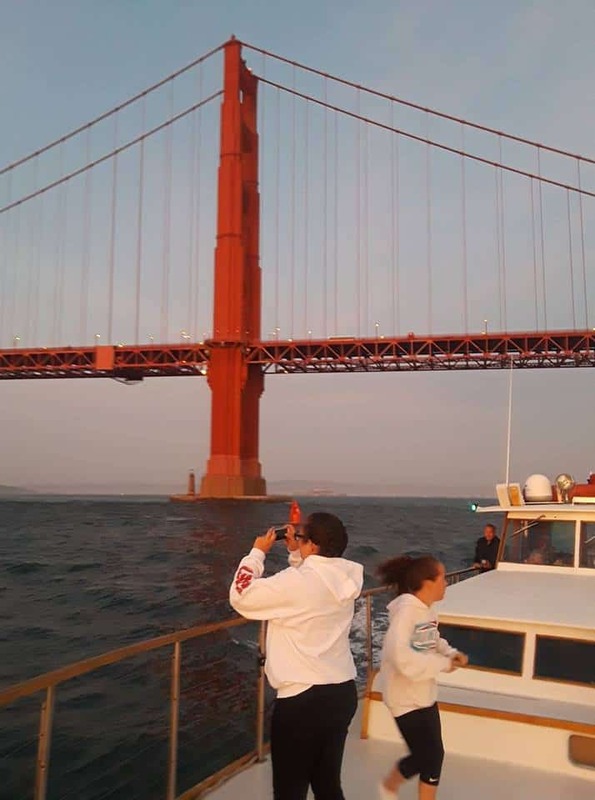 Our guests and crew agree that the best way to view the Bay Lights is on board Just Dreaming. It makes for the perfect close to the end of a beautiful day out on the water. May you have the health of a salmon –a healthy heart and a wet mouth. 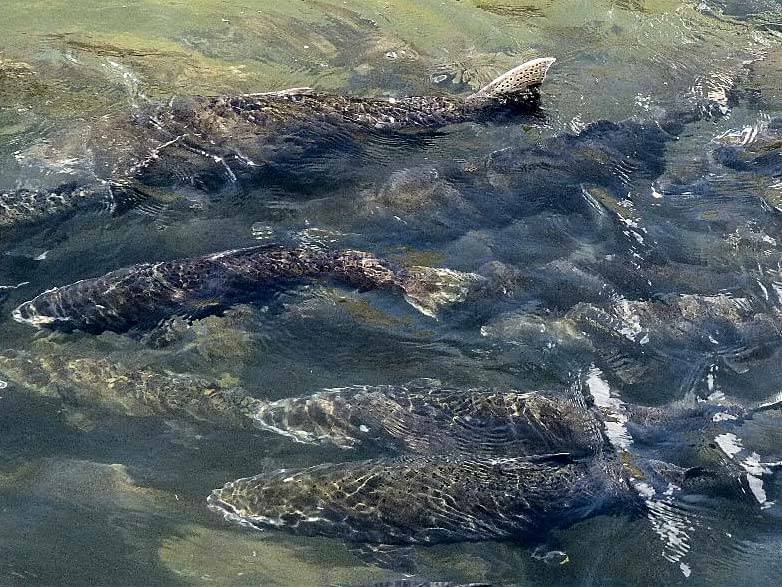 It’s the time of year when adult Chinook salmon enter San Francisco bay on their way to spawn in the upper reaches of the Sacramento River, Stanislaus River, and all with waterways up alongside the coast of Northern California. After feeding on krill (small crustacean) in the Pacific getting ready for their long trek, massive schools of salmon move under the Golden Gate into the open area known as California City, North of Angel Island and just South of San Quentin State Prison. Named originally for the Chinook peoples of Washington, Chinook Salmon are the largest of the Pacific Salmon species, and often referred to as King Salmon. And, due to the selfless efforts of many to save them, the salmon are in abundance this year. 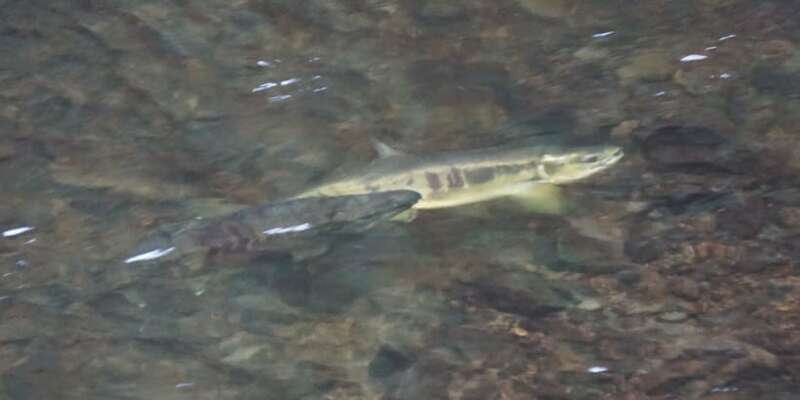 Because of the drought of 2015, with such low water in the streams where the spawn, there were fear that juvenile salmon would not being able to make it down from their spawning grounds on the various rivers and tributaries to continue the cycle. Numerous organizations worked together to truck many of the juvenile salmon safely down to permit the cycle to continue. At the same time, as always, state and federal hatcheries worked hard to replenish salmon populations. It is no secret that hatcheries throughout the state bulked up to insure, as best anyone can, the continued presence of salmon in San Francisco Bay and in our favorite restaurants and stores. The presence of salmon is insured with the release of salmon smolts in and leading to San Francisco Bay. Smolts are young salmon or trout, at which point they become silvery and migrate to the ocean for the first time. They will stay in the ocean for seven years, on average, growing in size and strength. Then, on average, at age 7 or so, they bulk up and travel back to the stream or river where they were started to give birth to the next generation. Starting back in 1974, SF Tyee Club’s began raising salmon from fingerlings out of the Oroville Hatchery to smolt status, when they release them into the San Francisco Bay. Tyee Club is located in an area known by fishermen as being in “California City.” It is a holding spot for inbound salmon. From there, they make their way up the rivers, tributaries and creeks to spawn the next generation. 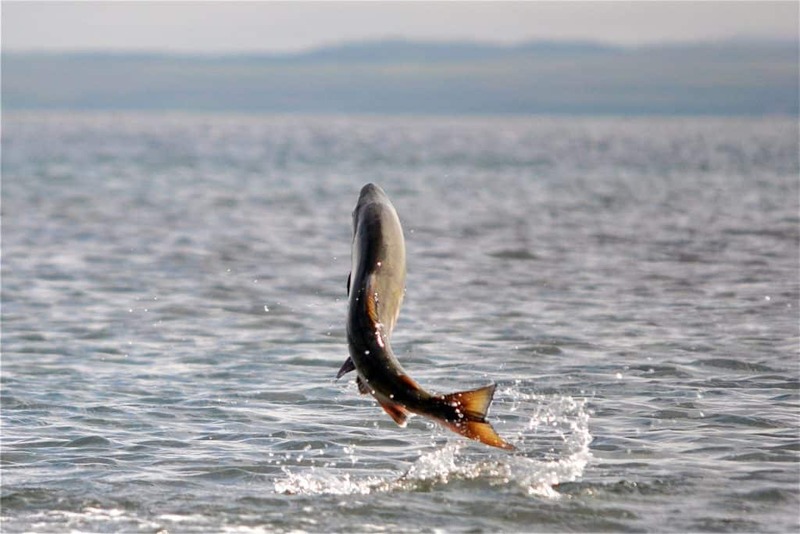 At this time of year, the smolts have mostly made their way out to the Pacific Ocean and the salmon run or salmon season for fishing adult salmon has begun. Needless to say, it is a great time for seeing salmon swimming in the bay near Tiburon and past California City, as well as to rivers from Redding to the Delta. This year, the efforts of so many have been blessed not only with an abundance of Chinook and Coho salmon, but also Chum or pink salmon, much more common in Oregon and Washington. 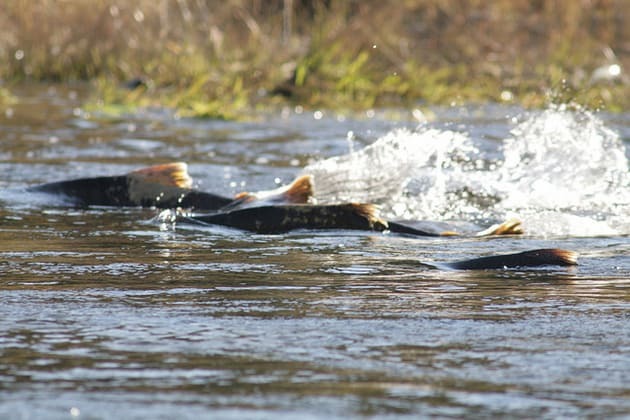 It’s unusual, but not unheard of for salmon to migrate in search of new spawning grounds. And, of course when they get here they find that there is an abundance of krill, anchovies and squid for them to eat. Insuring a health eco system insures their continue presence. Join us on board Just Dreaming Yacht for your very own private yacht charter to watch this magnificent migration and the capture of adults in the wild for a culinary treat. For more information, click Exploring the Bay. After spotting many leopard sharks and rays washed up on the shores of the bay last year, we have been happy to see plenty of them frolicking in the water with our charters on board Just Dreaming Yacht this Spring. In fact, we have a had a number of rays swimming around us at South Beach Harbor this Spring. 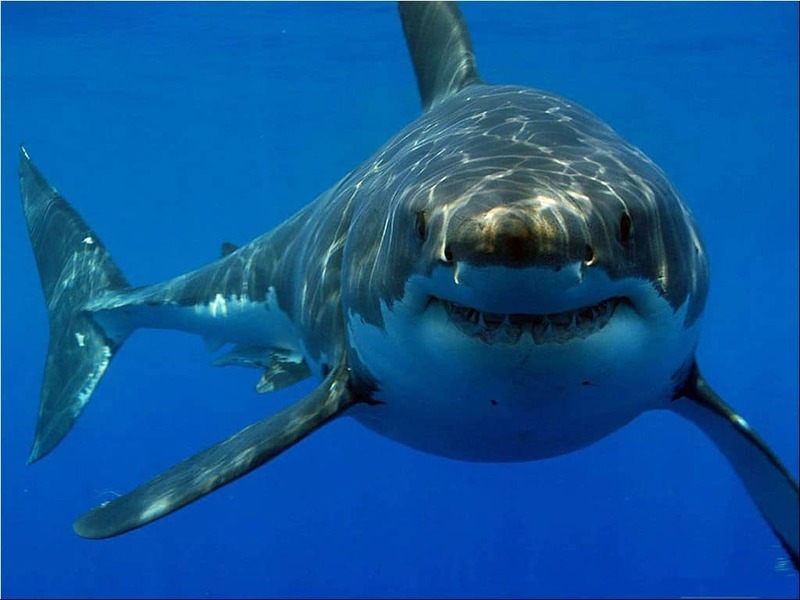 When people think of sharks, they are often reminded of Jaws and the presence of Great White Sharks out past the Golden Gate Bridge and around the Farallones. Once in a great while they come into the deeper waters of the bay, most often around Alcatraz. 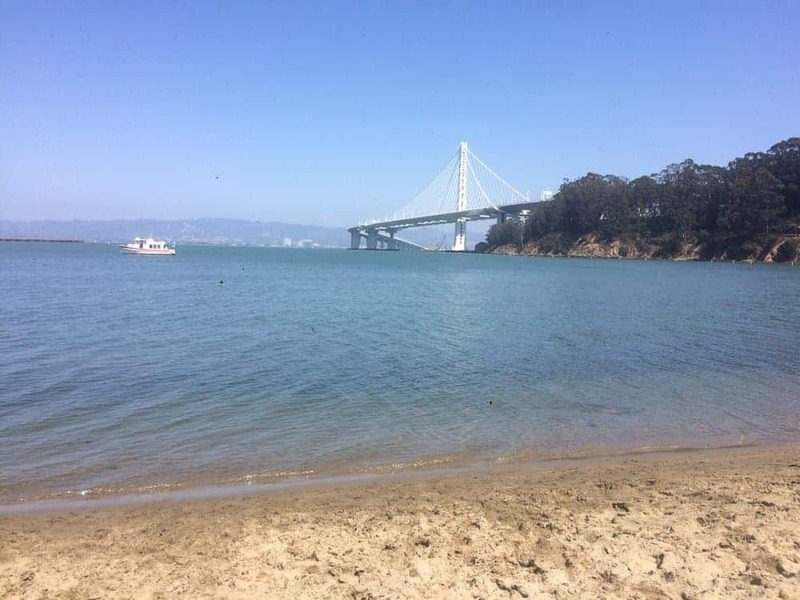 And the San Francisco bay is teaming with a variety of less aggressive and smaller sharks swimming alongside harbor seals, whales, and rays. A leopard shark swims along the surface of the water. One of these is the leopard shark. The leopard shark is completely harmless to humans. They feed on crabs, shrimp, worms and small fish. Beautiful to look at with their brown-grey spots, they sometimes swim in the shallower areas of water all the way down to the South Bay. At this time of year, there are pups as well. As small as they are, our guests find they really have to be looking in the water once we make it to a dock, where the shallow water provides better visibility. 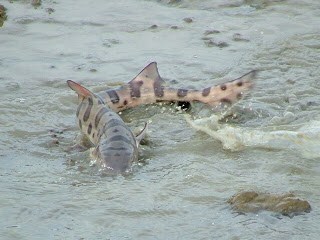 Leopard shark frolicking about in shallow water. The San Francisco Bay is also home to Broadnose Sevengill Shark, sometimes called Soupfin or School Sharks. We spot these more readily due to their large fins, for years prized as a delicacy in Chinese cuisine. Fortunately, they are no longer being commercially fished in the bay, though at their enormous size, up to 10 feet long and 250 pounds, they are one of the few true aquatic predators to make the Bay its breeding ground. They feed on Harbor Seals and other sharks. 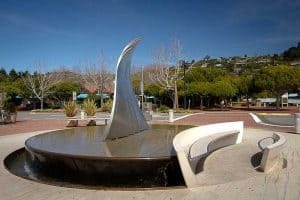 “Coming Out” sculpture in Tiburon resembles a shark fin, sails, or waves, depending upon vantage point. The city of Tiburon, or “shark” in Spanish, was named for the lagoons in the area where sharks mate in the breeding season. It is a stunning ritual we’ve been lucky to spot with some of our charters. A few weeks ago, we spotted a six-foot shark jumping out of the middle of the bay, fulling clearing the surface of the water by about eight feet. With a jump like that, we figured he was avoiding becoming dinner for a much larger fish. We have had plenty of passengers leery of the sight of their dorsal fins poking out of the water. The sheer size of them swimming around the yacht is enough to send little shivers down the spine. Our crew and guests are simply awed by their beauty. What is less known is that the Bay is one of only two of their breeding grounds. Around this time of year, the pups are born and the sharks head out into the open water. Summer is the perfect time of year to watch the wildlife in the water. With whales, sea lions, harbor seals, sharks, and all of their young, being on board Just Dreaming Yacht is a true escape from the bustle of the city with sights to wow the whole family. A few weeks ago, we had the pleasure of bringing a small group of executives out to Treasure Island for an afternoon wine tour with Just Dreaming. It was a gorgeous afternoon, so gave them the grand tour, cruising out toward the Alameda Estuary, giving them an up-close view of the cranes of the Port of Oakland, before making our way under the Bay Bridge and over to the dock. After docking at Clipper Cove Way, we walked them over to The Winery SF. They loved the vast industrial space, with wine barrels lining the walls. More than that, they were wowed by the Viognier, a Gold Medal winner in the San Francisco Chronicle Wine Competition. We were close enough to the boat that they bought several bottles and took them back to the boat. 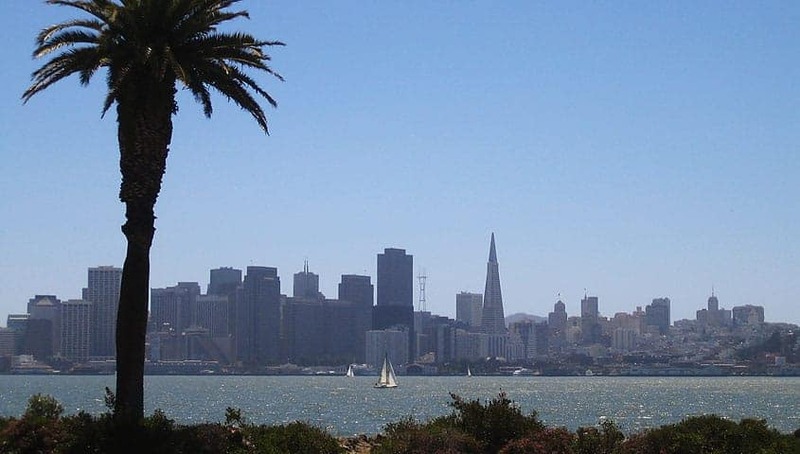 From there we showed them the views of the Bay Bridge, walking alongside the water before turning up on Avenue I to visit the island’s original winery: Treasure Island Wines. Originally founded as a collective in 2007, the grapes are sourced from all over California with all phases of wine production are performed on-site. We were surprised at how much their faces lit up when they saw all of the dogs. The tasting room at Treasure Island Wines isn’t just dog friendly. The tasting fee is waived if you bring your dog. Perfect! The highlight of the tour for them may have been Fat Grape because of its unique location and sulfite-free wines. Fat Grape is located inside the former Navy Brig, an ironic and unusual setting for merriment. Or, it may have been Sottomarino Winery, or “submarine” winery. 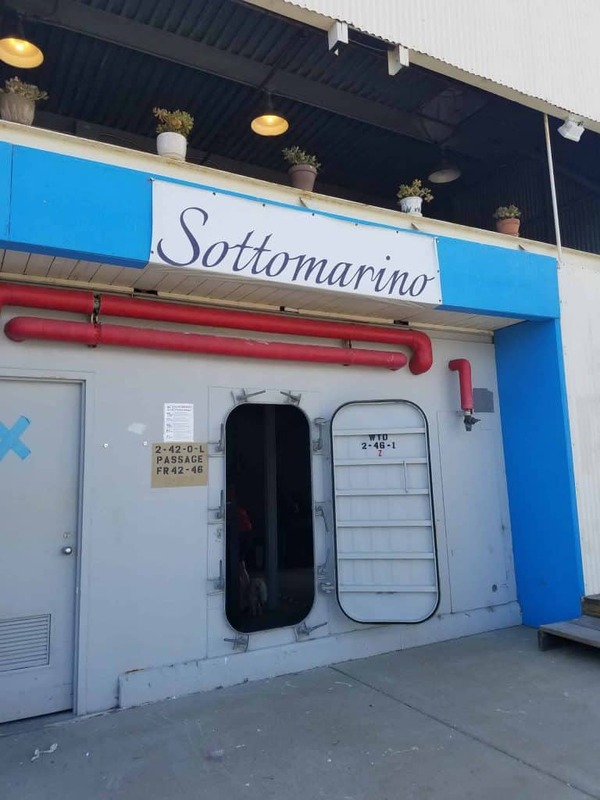 Sottomarino features Italian style wines, such as Sangiovese, served on board the USS Buttercup, a former World War II submarine training vessel. 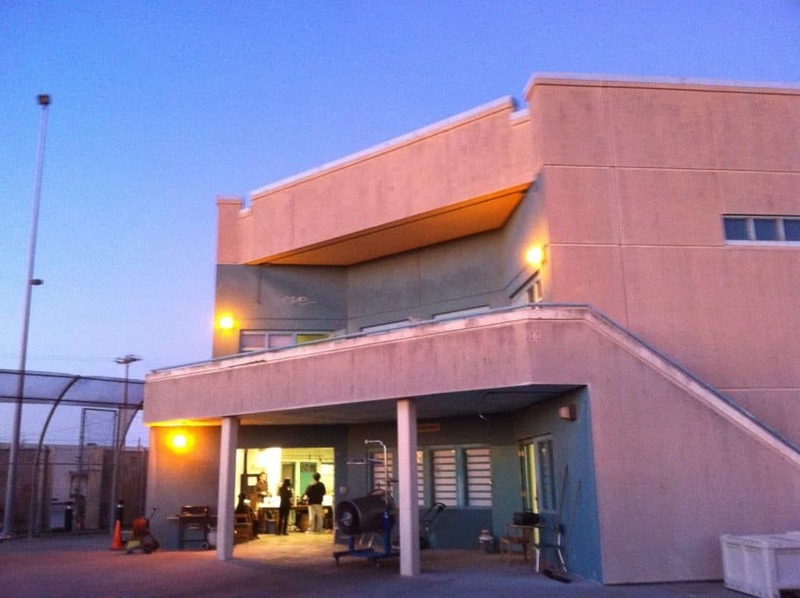 Though landed and renovated, many of the original details remain, including the escape hatch. Wrapping up our tour, we headed back to Sol Rouge, the tasting room for the Napa Valley Winery, where they played Bocce Ball, glasses of Cabernet Sauvignon in hand, admiring the beautiful view of the Bay Bridge in the background. There was so much more they didn’t get to see! While they positively loved the tasting rooms, there were more they didn’t get to try along with so many historic buildings to see, not only those built by the Navy, but a few built for the World’s Fair in celebration of the completion of both the Bay Bridge and the Golden Gate. As they left, they realized there was even a spot for to drop anchor and spend the night. What a way to spend a weekend after meetings in the City. Join us! One of the biggest hits from our galley on board Just Dreaming is our Tom Kha Gai soup. 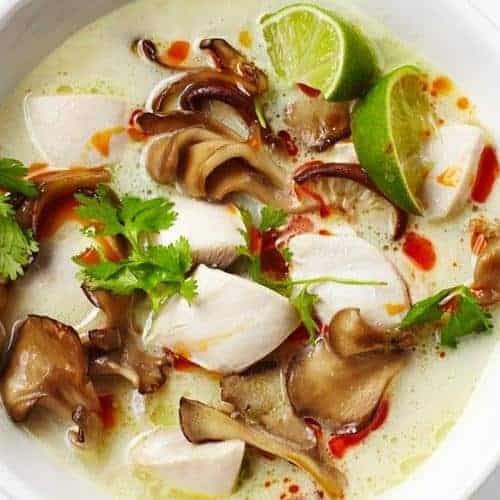 Also known as Thai Chicken Coconut Soup, this dish is flavorful, delicious, and exotic. It is a perfect dish on the yacht when the cold wind kicks up. “Tom Kha Gai Soup” literally means “chicken galangal soup.” It is based on the 19th Century Siamese recipe, Tom Kha, a dish of chicken or duck served in a coconut broth flavored with galangal, a spice in the ginger family with hints of citrus and sweetness. It was then paired with a chili jam, similar to sweet chili sauce. Moving into the 20th century, the dish morphed into Tom Kha Gai, a mainstay in Thai and Lao cuisine. The main ingredients are coconut milk, galangal, lemongrass, kaffir lime leaves, mushrooms, and chicken. It can be mild and delicately spiced or set your mouth on fire spicy. We will make it to your liking. When we first had it, we were sitting on the deck, watching the sunset just approaching the Golden Gate Bridge. It was awe inspiring. With the beauty of the ocean, the hills, the bridge, a slight breeze, and the delightful spice and warmth of the soup, we found ourselves completely in the present, all of our senses engaged. It made for a perfect escape from the day to day. And as we wound back around the bay, passing Angel Island, Sausalito, and back toward the city, we enjoyed the glory of the skyline, the pleasure of each other’s company, our friends and family: the crew of Just Dreaming. There really is nothing like the smell of ocean air, the view of the bay, the feel of the breeze in contrast with the smells, taste and warmth of the soup. The powerful combination brings you right into the present. This is living! On your next trip onto the bay with us, order it in advance, or any of our custom menu options.